Home Moto "I would not have done Alonso's magic with ten legs"
"I would not have done Alonso's magic with ten legs"
Alex Zanardi praises the esteemed performance of the Asturian driver in the rain at Daytona International Speedway. 'El hombre del paraguas'. This was the nickname that the Americans put to Fernando Alonso after his distinguished performance at the 24 Hours of Daytona 2019, where the Spaniard guided Wayne Taylor Racing to victory under conditions of poor visibility and strong rain. A piloting that has not gone unnoticed by some rivals. Like Alex Zanardi. The Italian, who was left without legs after a terrible accident in 2001 while he was competing in an IndyCar race, has assured his personal Twitter account that he would not have reached the speed of the Spaniard, even if he had ten legs. .
"Commissaries, it's true!" But as crazy as it seemed at that moment, look who the winners are! 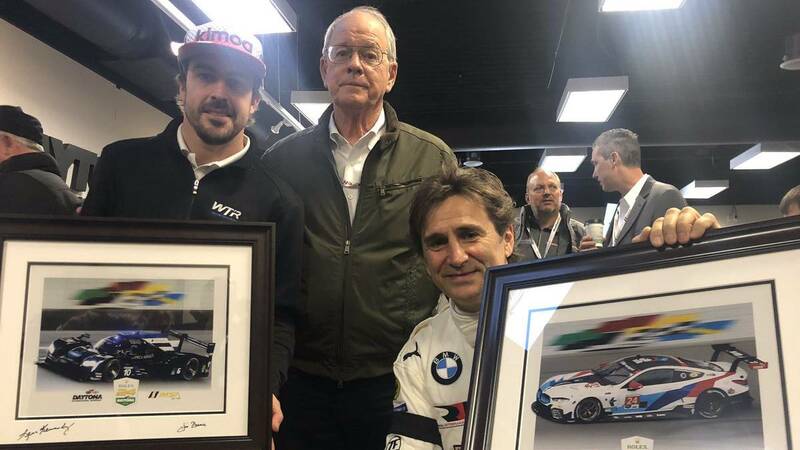 Even with ten legs, he would not have displayed the magic shown by Fernando Alonso and Augusto Farfus There is something that needs to be found in the American races that Formula 1 lost a long time ago, "Zanardi wrote.